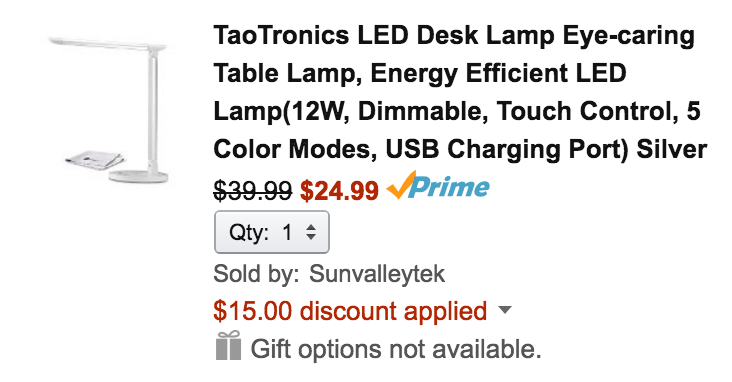 Sunvalleytek (100% positive feedback from nearly 80,000 customers) via Amazon offers the TaoTronics 12W LED Desk Lamp with USB Charging Port for $39.99. Applying coupon code 4ZHI2M2L drops the final price down to $24.99 Prime shipped. That’s nearly a 40% savings off the regular price and one of the best offers we’ve seen on this model. This is the best-selling desk lamp at Amazon with an impressive 4.8/5 star rating from over 1,700 reviewers. Whether you’re decorating a new dorm room or updating your desk, TaoTronics’ LED lamp is a great option. It has seven levels of dimming, a built-in USB charging port and five different color modes. TaoTronics new generation energy-saving LED Desk Lamps is an energy efficient, low power consumption LED light source. The lamp is adjustable and dimmable for multiple brightness settings, making them ideal for home and office use. Say goodbye to old incandescent light and faintly illuminated working space, and say hello to this elegantly designed, modern looking and energy-efficient source. Designed to blend naturally into any scene and provide flicker-free and ghost-free lighting that is pleasant and comfortable to your eyes. Even after long hours of use, your eyes will feel less fatigue than with traditional types of lighting. With a slight touch from your finger tips, you can switch through 7 brightness level to fine tune your illumination.